Paul Ryan has supported privatizing Social Security. 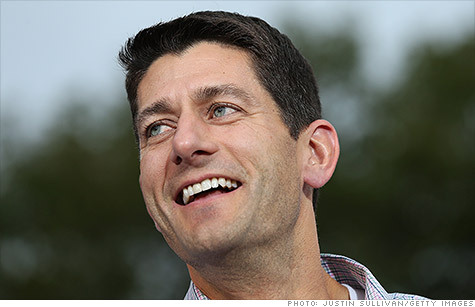 NEW YORK (CNNMoney) -- Representative Paul Ryan has long wanted to let Americans invest part of their Social Security taxes in private investment accounts. After legislation he co-sponsored in 2005 went nowhere, Ryan included a detailed plan to privatize Social Security in his budget proposal in 2010. Under that plan, he would allow workers to funnel an average of roughly 40% of their payroll taxes into personal retirement accounts. Mitt Romney, who chose the Wisconsin lawmaker as his running mate on Saturday, has also voiced support for private accounts. He has said he likes the idea of allowing people to put some of their funds in accounts with higher returns than Social Security. "Personal accounts will be a big plus," Romney said at a town hall meeting in 2007. The thinking is that people would gain control over a portion of their retirement savings and be able to build bigger nest eggs by investing in stocks. Another plus: They could pass the accounts along to heirs. But neither Ryan nor Romney have said much about private Social Security accounts lately. Ryan dropped it from his more recent budget proposals, while Romney doesn't mention it on his campaign Web site. Adding private accounts to Social Security has been a hugely controversial issue for many years. President George W. Bush's effort to create such a system in 2005 went down in flames in the face of Democratic resistance. Since then, there haven't been any serious attempts to open the retirement program to the stock market. And, of course, the market's roller coaster ride of recent years soured many Americans' view on the idea. "Because of the ups and downs of the market, people see taking their Social Security nest egg and investing it in the market as a risky proposition," said Dan Adcock, director of government relations and policy for the National Committee to Preserve Social Security and Medicare. There's another reason why many supporters of private accounts have fallen silent in recent years ... that's because Social Security is no longer running a surplus. When the system was taking in more funds than needed, it could afford to let people direct some of their payroll tax towards individual accounts. But now that the surplus has ended, the system needs all the payroll tax money to pay benefits to current retirees. So private accounts became less desirable because any diverted funds would have to be paid by the federal government. "There is no spare money anymore," said David John, a senior research fellow at the Heritage Foundation. That didn't stop Ryan from suggesting it be done. His budget plan unveiled in 2010 called for allowing Americans to open private accounts starting this year. "Due to the higher rate of return received by investments in secure funds consisting of equities and bonds, these accounts would allow workers to build a significant nest egg for retirement that far exceeds what the current program can provide," he wrote in the proposal. Starting a private account would be optional, and their contributions would be guaranteed if the market goes south. The accounts also could be passed down to heirs. More recently, however, Ryan scaled back his plan. In the budgets he proposed this year and last, he now cites ideas put forth by the President Obama's bipartisan fiscal commission, on which he served, that would strength Social Security. These include raising the retirement age and reducing benefits for wealthier retirees. Romney's campaign website lists the same recommendations. Asked about the change, a Romney spokesman said the candidate has "a comprehensive plan to save Social Security with commonsense reforms."